Priestley, Documentary, Realism and Democracy: open one-day conference sponsored by the J.B. Priestley Society. 9.45-17.00 West Yorkshire Playhouse, Leeds. 25 October 2014. There is still time to book a place at this fascinating conference, which includes Special Collections staff among the speakers. It is eighty years since the publication of J.B. Priestley’s English Journey . The book influenced a whole generation on its appearance and has since inspired numerous responses and sequels. This conference aims both to do justice to that impact and also to consider wider issues raised by the documentary and social-realistic work of Priestley and his contemporaries in the Thirties and Forties. Alison Cullingford will introduce delegates to the Heinemann Scrapbook, which shows how the publisher whipped up interest in Priestley’s controversial comments on English cities (image above). Martin Levy will explore belatedness and Priestley’s social philosophy. Other speakers will cover aspects of cinema, Orwell, Muir, social fiction and Priestley’s wartime suspense stories. To find out more and book your place, see the conference mini-website. 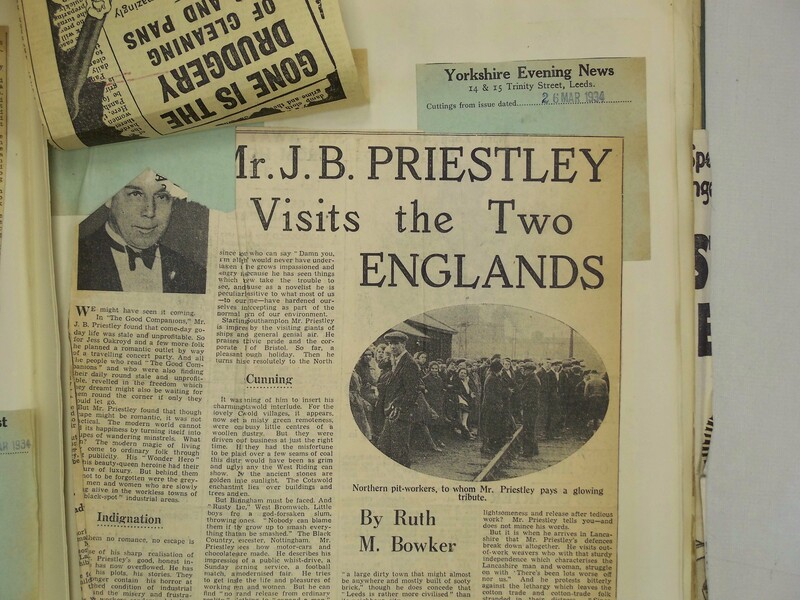 On Sunday 20 October 2013, the National Media Museum in Bradford and the J.B. Priestley Society will show a rare and fascinating film by J.B. Priestley. Originally a 1943 play, They Came To A City was filmed in 1944 by the director Basil Dearden. Experts Bill Lawrence, Michael Nelson and John Baxendale will lead a discussion about Priestley’s role in cinema, a comparatively little known aspect of his work. They Came To A City is part of the conversation that was going on throughout the Second World War in Britain: what should society be like after the War? J.B. Priestley was deeply engaged in this debate. He addressed these questions rather gently in his famed Postscripts and much more directly in his essential Out of the People. He believed that new better ways of living could come out of the War, that the mistakes made after the First World War did not have to be repeated.